My basil plants are growing like crazy. What am I to do with all of this pesto? 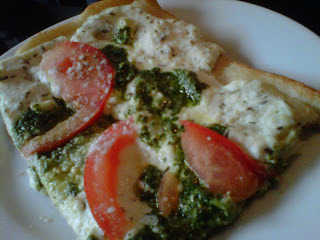 Well, I recently had something of a "pizza week" and the first pizza on the menu was ricotta, pesto and tomato. This would fall into the "white pizza" category. If you're not familiar, that means it doesn't have any tomato sauce on it but ricotta cheese serves as the sauce, which is not particularly low calorie but tasty none-the-less. This is a very simple pizza combination and perfect for a weeknight meal and another use of fresh pesto you might have (directions here) from a basil explosion. I used a pre-made Pillsbury crust but if I were doing this on a weekend I would try to make my own dough because I found the pre-made crust to be adequate but not delicious. Mix thyme with ricotta and spread on prepared pizza crust and sprinkle with Parmesan. Place small spoonfuls of pesto on top of ricotta and finish by spreading sliced tomatoes on top. Bake for 8-10 minutes at 400 degrees or according to the directions for the pizza crust. Looks good doesn't it? While one full-sized pizza is a too much for even two meals, this was quick and easy to make, making a single person friendly.